Because we’re having old carpet pulled up and tile installed, we decide to take a little holiday, Monday through Friday, and leave the guys to it. We hear it will be a dusty venture. We’re not familiar with the Corpus Christi/Port Aransas area so we decide to spend a few days there. We hear that the Padre Island beaches are nice. Don, the contractor is claiming that the work will be done by Friday, but David and I have doubts. It’s a large area to cover—four bedrooms, three bathrooms, a large den, and the kitchen. We get away noonish and the trip is uneventful, three and a half hours on mostly good road, though San Antonio’s highways are a disgrace. We’re staying in Corpus Christi, at The Residence Inn, a Marriot offshoot, which proves to be nicer than we expect, with two desks, two comfortable bedrooms with bathrooms, three TV’s, and a kitchen/dining area. On Monday evening we take a walk along the water, have dinner at Landry’s, then turn in early. On Tuesday morning we look forward to going for a walk along the beach out on the island. But as we’re preparing to leave David gets a call. He goes still and I can tell by his dreadful calmness that something bad has happened. “That’s the last thing I wanted to hear,” he replies to whatever’s been said. Once again he goes silent, leaving me curious and trepidacious. “What’s the next step?” he asks. More of the caller talking while David holds the phone to his ear. At last, obviously troubled, he gives a good-bye and ends the call. “The tear-out exposed a water leak in the shower of the master,” he tells me. I replay the grandiose phrase in my head. The Shower of the Master. My imagination interrupts my anxiety. What does the Master’s shower look like? Is it bedecked in gemstones and gold? What has the Master done to deserve this magnificent shower? Does his possession of this shower create resentment amongst the staff that must keep it free from mildew and lime deposits? I return to reality. This is terrible. But Don assured David that, though his crew can’t do any further work in the master until the leak is fixed, they will do the other rooms and return after the shower has been deconstructed and rebuilt. We drive to Port Aransas through the thickest fog either one of us has ever seen. Visibility is no more than a hundred feet. The island town is still rebuilding from Hurricane Harvey. Crumbling walls and rotting roofs stand shoulder-to-shoulder with the pristine new-builds. The beach is as great as we’ve been led to believe. Broad and flat with firm sand. Very clean. I never thought I’d see a beach comparable to the beaches of Goa, but the beach outside of Port Aransas is that nice. Also, much easier to get to. David’s on the phone for the whole walk. He calls a friend of his who knows a contractor and then he calls the contractor. He calls a neighbor and asks him please to stop by the house, take a look, and let us know if it’s really as serious as Don says it is. He gets a call from Don telling us that it’s worse than he originally thought. They think the pan is compromised. The water’s been standing for a long time. There will be mold. Poor David is hardly getting to enjoy the beach. While he’s handling the situation I watch people play with their dogs and I wave to men who take their fishing seriously; and I judge the dozing geezers in their lounge chairs whose bare abdomens rise high like round mountains. Our plan is to stay in Corpus for a couple of days, then spend a night in a hotel along the River Walk in San Antonio, where we’ll drink bloody marys and wonder about the people who stroll by; and after that, a night at a multi-starred B&B in Fredericksburg. Home on Friday. But the next morning the report we receive from Don is even more dire than yesterday’s. The wall and floor of the bedroom that abuts the shower has also sustained damage. Together we sigh a sad sigh. We turn into the neighborhood at around two. Trucks line our driveway. The interior of our home is a construction site. Floors are torn up. 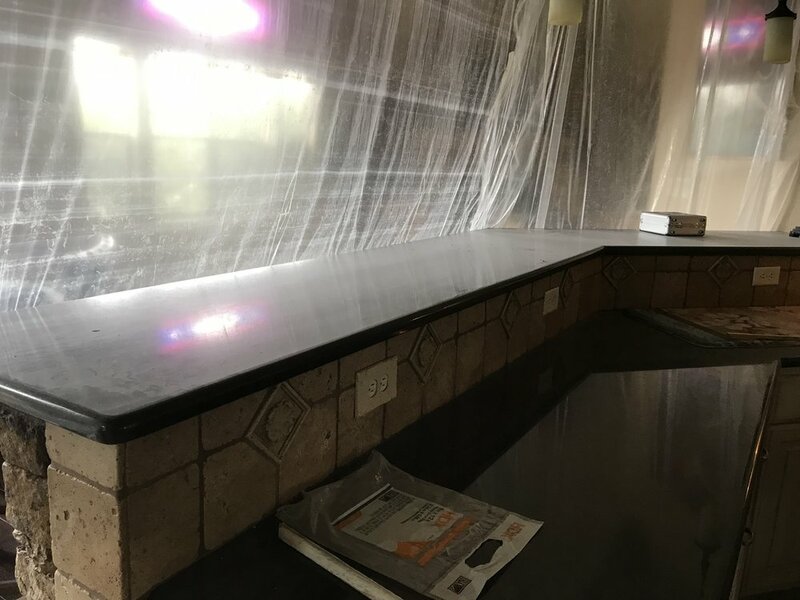 Dust coats everything. Pieces of furniture have been taken from places that make sense and scattered willy-nilly throughout the house. We have a working toilet in one bathroom and a working sink in another. The toilet in the master leans at a precarious angle in the tub. The refrigerator is in the middle of the kitchen and the stove has been moved to the dining room, along with a mattress, a chest, three office chairs, a desk, and tons of other stuff. Our formal living area, which ordinarily holds a couch, a chair, and a central table now holds sixteen pieces of furniture, all crammed together and I can’t get to any of them. We’re advised not to take any action toward repair until we talk to our insurance agent, who ignores our calls for two days. When we finally hear from him he tells us he can’t get out here for five days. We can’t get started on the work until he does his assessment. Also, it’ll take time to find a contractor. What we thought would be a two-month ordeal is going to turn into a three-month ordeal. I don’t do well in chaos. 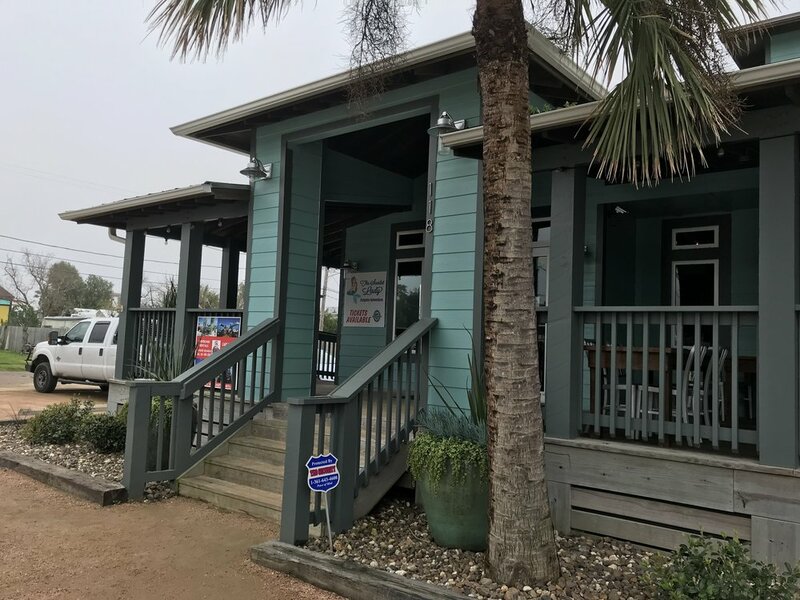 MacDaddy’s, tasty food for lunch in Port Aransas. The bar draped in plastic. Can you tell how dusty it is? That much dust is everywhere.